A single sheet of graphene, comprising an atom-thin lattice of carbon, may appear to be rather delicate. MIT engineers, however, have discovered that the ultrathin material is remarkably sturdy and remains intact under applied pressures of at least 100 bars. This is equivalent to almost 20 times the pressure generated by a typical kitchen faucet. The researchers found that the key to withstanding such high pressures refers to the pairing of graphene with a thin underlying support substrate that is pocked with small holes, or pores. The graphene becomes more resilient under high pressure when the substrate’s pores are smaller. Rohit Karnik, an associate professor in MIT’s Department of Mechanical Engineering, states that the study’s results, recently reported in Nano Letters, are used as a guideline for designing tough, graphene-based membranes, especially for applications like desalination, in which it is essential for filtration membranes to withstand high-pressure flows in order to efficiently remove salt from seawater. 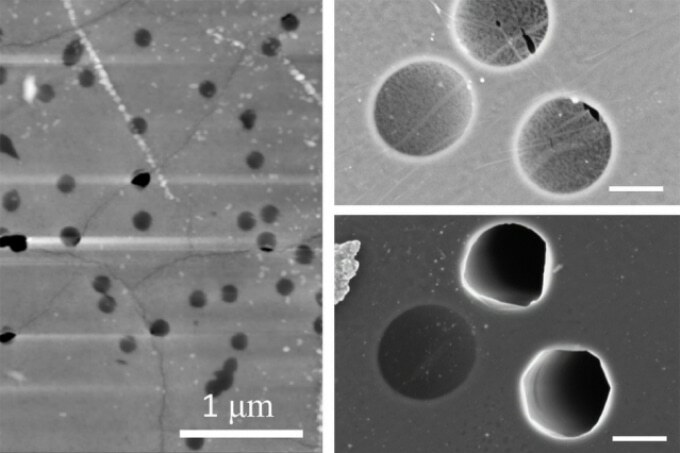 We’re showing here that graphene has the potential to push the boundaries of high-pressure membrane separations. If graphene-based membranes could be developed to do desalination at high pressure, then it opens up a lot of interesting possibilities for energy-efficient desalination at high salinities. A number of commercial membranes desalinate water under applied pressures of about 50 to 80 bars, above they are likely to get compacted or otherwise suffer in performance. Membranes can actually enable more effective desalination of seawater by recovering more fresh water if only they were capable of withstanding higher pressures, of 100 bars or greater. It could also be possible for high-pressure membranes to purify water that is extremely salty, such as the leftover brine from desalination that is typically too concentrated for membranes to push pure water through. It’s pretty clear that the stress on water sources is not going away any time soon, and desalination forms a major source of fresh water,. Reverse osmosis is among the most efficient methods of desalination in terms of energy. If membranes could operate at higher pressures, this would allow higher water recovery at high energy efficiency. Karnik and his colleagues carried out experiments to study how far they could push graphene’s pressure tolerance. Earlier simulations have predicted that graphene is capable of remaining intact under high pressure when placed on porous supports. However, these predictions have until now not been supported by direct experimental evidence. The team used a technique called chemical vapor deposition to grow sheets of graphene. Single layers of graphene were then placed on thin sheets of porous polycarbonate. Each sheet was designed with pores of a specific size, ranging from 30 nm to 3 μm in diameter. The team gauged graphene’s sturdiness by concentrating on micromembranes, referring to graphene areas that were suspended over the underlying substrate’s pores, similar to fine meshwire lying over Swiss cheese holes. The graphene-polycarbonate membranes were placed by the team in the middle of a chamber, into the top half of which argon gas was pumped by using a pressure regulator to control the flow rate and pressure of the gas. The team also measured the gas flow rate in the bottom half of the chamber, pointing out that any increase in the bottom half’s flow rate would in fact indicate that parts of the graphene membrane had failed, or “burst,” from the pressure produced in the top half of the chamber. It was discovered that graphene, when placed over pores that were 200 nm wide or smaller, was capable of withstanding pressures of 100 bars — almost twice that of pressures commonly encountered in desalination. An increase in the number of micromembranes that remained intact was observed by the team as the size of the underlying pores decreased. Karnik explains that this pore size is vital for determining the sturdiness of graphene. The question at this point is whether graphene can withstand high pressures while selectively filtering out water from seawater. The group answered this question by first fabricating nanoporous graphene to serve as an extremely simple graphene filter. The team used a technique they had earlier developed to etch nanometer-sized pores in sheets of graphene. These sheets were then exposed to increasing pressures. In general, the researchers discovered that wrinkles in the graphene had a lot to do with whether micromembranes burst or not, despite the pressure applied. Parts of the porous graphene that lay along wrinkles burst or failed, even at pressures as low as 30 bars, while those that were not wrinkled remained intact at pressures up to 100 bars. When the underlying substrate’s pores are smaller, the micromembranes in the porous graphene are more likely to survive, even in wrinkled regions. As a whole, this study tells us single-layer graphene has the potential of withstanding extremely high pressures, and that 100 bars is not the limit — it’s comfortable in a sense, as long as the pore sizes on which graphene sits are small enough. Our study provides guidelines on how to design graphene membranes and supports for different applications and ranges of pressures. Baoxa Mi, an assistant professor of civil and environmental engineering at the University of California at Berkeley, explains that graphene is widely considered to be one of the strongest materials present in the world. The possibility of whether porous graphene is capable of exhibiting similar strength remains to be uncertain till now. This research was partially supported by the MIT Energy Initiative and the U.S. Department of Energy.